Braced to be the next high profile African film launched on Netflix, The Burial of Kojo is a temporal feature debut of acclaimed musician and filmmaker Samuel “Blitz” Bazawule. The film joins company with – amongst many others – Beasts of No Nation, Queen of Katwe and Chiwetel Ejiofor’s directorial debut, The Boy Who Harnassed the Wind. Since its initial Kickstarter campaign in 2017, the film has gone on to win Best Narrative Feature (World Cinema) at New York’s Urbanworld Film Festival and captivated the digital space, reaping international premieres across Africa’s global continent in London, Bahia, Brooklyn, Johannesburg and Accra. Seen through the eyes of its main character – 8-year-old Esi, played by Cynthia Dankwa – The Burial is narrated by British-Ghanaian actress Ama K. Abebrese, who takes us on a journey that includes a father-daughter bond and disturbing family ruptures. In this interview, Bazawule speaks about the origins of his creative vision. If you’re going to be a representative of an audience who don’t have the privilege to be in Accra, then you have to move like one of the people. Q) Can you say a little about the film’s conception? I wanted to create something that showed Africa’s vibrancy. Something that was the antithesis to the de-saturated, non-personal way that a lot of African film is shot, with little connection to subject and environment. I’ve always recognised that as not the Africa I know. Q) The narrative structure in the film is quite unique. What were your influences? The making of the film revolved around my understating of storytelling. My first experiences were my grandmother’s stories. They were extremely visual and magical; almost teetering on the edge of reality. Her sensibility and the kind of choices she would make [determined] who was centred and who was peripheral. Sticking with the nuclear family was also key. It’s something and I refer to as genetic memory. It’s like a guiding light that I used to make the film. Some decisions were not even mine to make in terms of where the camera goes. There is something inside that remembers a space, time and circumstance. This film comes mainly from an unconscious realm – and not from a conscious stream. It meant that I had to circumvent western narrative styles, which often dominate. What often happens is that we [Africans] force our complex narratives through a very basic three-act structure. Q) Is genetic memory an exclusively African way of telling stories? I’m not saying it’s exclusive, I’m just saying that we seldom – irrespective of who we are – circumvent these standards, which is really just a euro-normative way of telling stories. Everybody has something engrained within them, which is a traditional sense of storytelling, and looking at the world. For example, my Director of Photography Michael Fernandez is Mexican. It was our job to remind ourselves that we had to remember what was within and not just go along with the standard. If you think about where most of your ideas about the diaspora or the world came from [pre-Internet], it was carefully curated for you. Q) … like being more engaged with your filmmaking practice in a spiritual or intuitive way? Exactly, which is why I feel some of the cinema from the African continent is so bad because we are so much further away from that intuitive space. Most indigenous or ancient cultures that Africa falls within are conceptually quite far from European style and ways of being. We have to do as much as we can to bring our way of telling stories into the 21st century. Q) Before making films you had a successful career as a musician. Your first short, Native Sun, was co-directed with Terence Nance as a companion piece to your album of the same name. How was the transition from music to film? Those things are one and the same to me. I’ve only considered my objectives and if they will work for the medium. I’ve told very vivid stories through music and very melodic stories through film. I’m thankful that my experiences have given me the opportunity to truly blend my gifts. I was no longer inspired to use music as my core medium. Motion picture has allowed me to expand the vocabulary and mythic ethos that I’ve had making my music over the years. Q) At the London premiere of The Burial you spoke about Africans claiming the cinematic and storytelling medium for themselves. What is your ethos as an African filmmaker? Firstly, I claim that, I am an African filmmaker. Some people love this ambiguous space of “I’m just and actor” or “I’m a writer”. I don’t think there’s anything wrong with being specific. It just so happens that there is a bias towards African filmmakers that means to claim the title is to claim access to a substandard in filmmaking, distribution or production budgets. I claim and celebrate the difference in being an African artist. When we arrived in Ghana I took Michael to Makola Market, where we [Ghanaian’s] are our freest. It’s where we let go of the things that restrict and separate us like class. If you’re going to be a representative of an audience who don’t have the privilege to be in Accra, then you have to move like one of the people. It was the only way to have a real film. Good or bad it’s important that these movements are reflected. We have to be obsessed with understanding our specific physical vocabulary. If the [African] eye sees that way, so must the camera. If you know of Djibril Diop Mambéty, Safi Faye or Kwaw Ansah you know the language has been birthed already. Not much vocabulary has been added and the reason for that is the assumed commercial value that comes with a lack of specificity, which is absurd logic. Your value comes from when you are stripped down to the core rather than embellishing yourself with borrowed robes. Q) The film is a really great case study for African filmmakers to consider how they can distribute their work and connect it directly with audiences. What was your strategy in releasing the film? It was very clear to me that the film was made for Black people of African decent globally. Those whose genetic memory was closet to the film. This isn’t to say others wouldn’t get it. It was important to route my film through the African Diaspora and the continent first as a way of vetting it through an appropriate critical lens. If people in Accra say yes, then I know I can walk confidently in the rest of the world. In knowing who the film was for, I could choose festivals that would support my ethos and attract the right people to write about my work with clear understanding. As a result I have seen my work embraced in a broader way. Africa and the diaspora can provide us with all the validation and the resources we need. Q) You have been quoted as saying the best thing to happen to Black filmmakers was social media. What are your thoughts on the digital African space and how it keys into your future as a filmmaker? Technology is the one possible equaliser. That’s not to say technology doesn’t have its biases. A consequence of the Internet is it allows us to access one another in a truly unique way. If you think about where most of your ideas about the diaspora or the world came from [pre-Internet], it was carefully curated for you. What I have observed with the Internet is direct access to each other’s narratives, and a purchasing power where I as a filmmaker, can raise close to $80k without having to answer to anyone about how I create my work. Other people can build on that narrative to raise funds, to attain direct access. We would not have been able to chart our own course for The Burial had the technology not been available. I don’t think success would be possible to this extent without being savvy enough technologically. 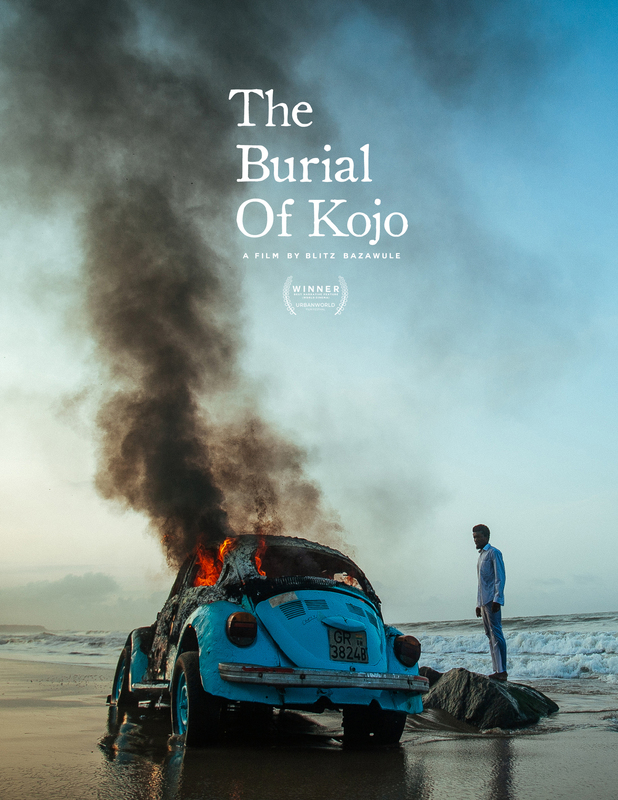 The Burial of Kojo is distributed by Array Films and arrives on Netflix on March 31. This interview by Tega Okiti comes from a partnership between Let’s Be Brief and People’s Stories Project (PSP) – part of the British Council’s arts programme in sub-Saharan Africa. Images courtesy of Samuel Bazawule.